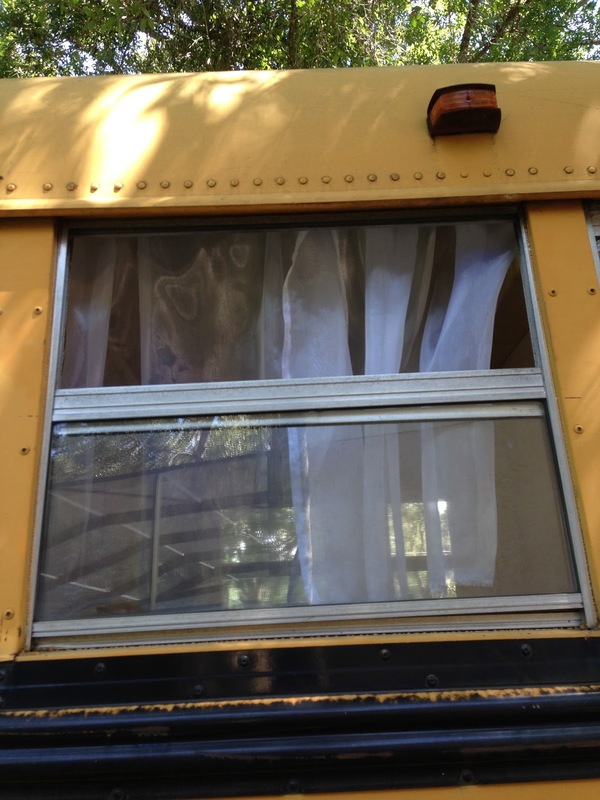 Just Right Bus: Walls, Curtains, Storage and More! 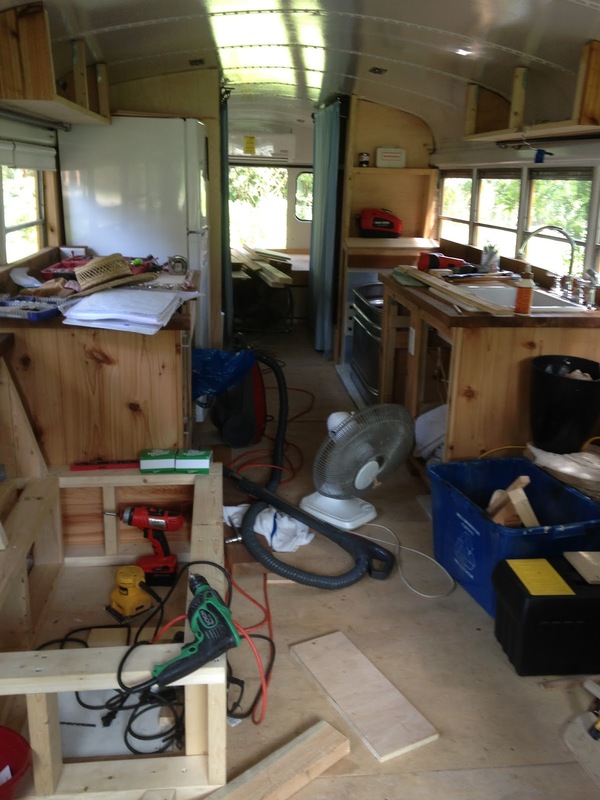 The Adventures of a School Bus Conversion to a Home that is Just Right for us. 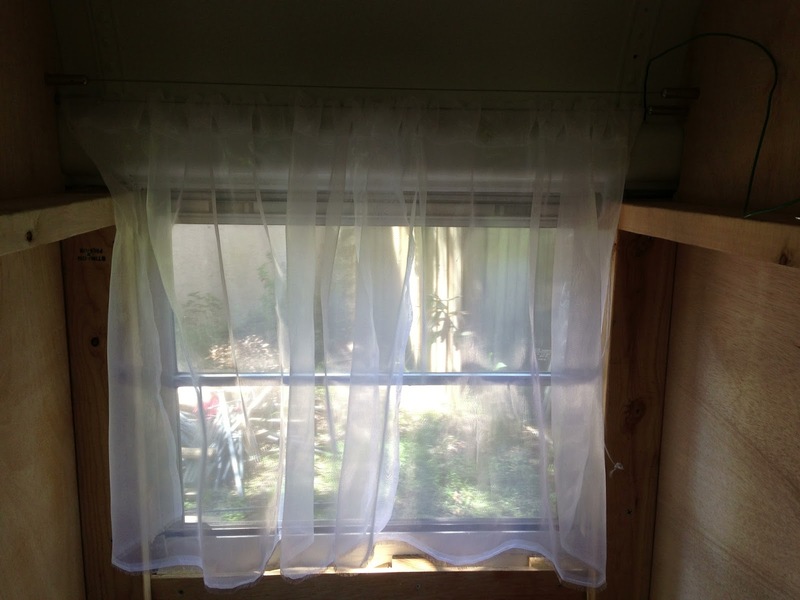 Walls, Curtains, Storage and More! Hello September! Man did you sneak up on us fast. Things have been crazy busy this summer and I just haven't had much time for writing blog posts. 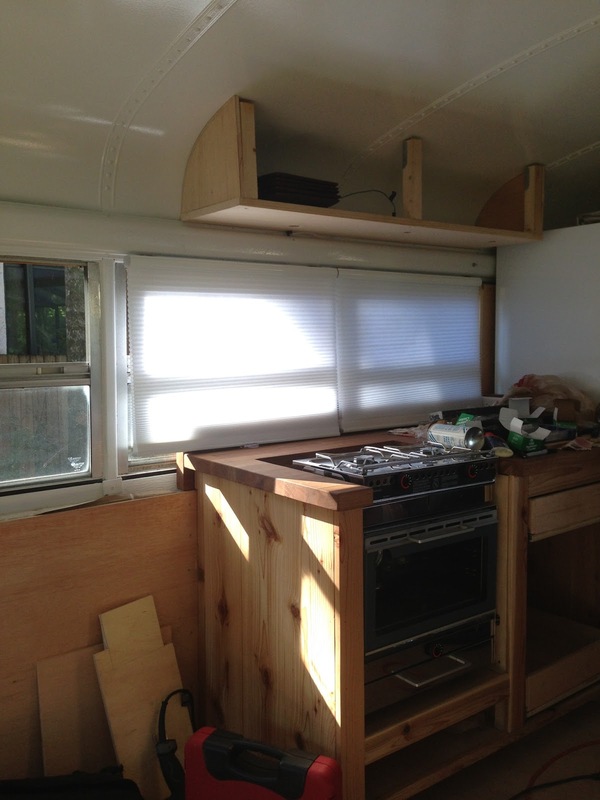 To make up for that I've dedicated today to getting the blog up to date on our progress. 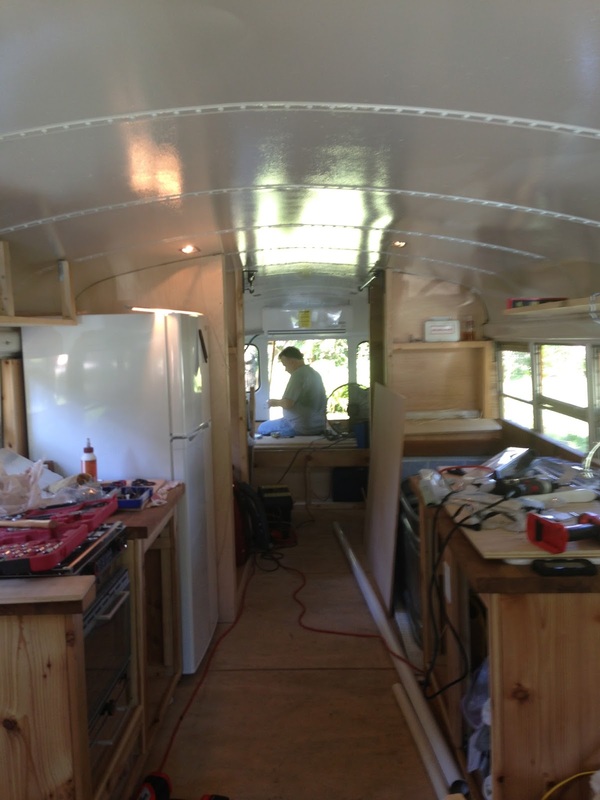 The bus has really transformed in the last month. Here is the bus today! It's a bit of a mess, but in those few weeks we managed to get all of the walls up, finish running all of the plumbing/electrical, installed all of the electrical outlets, began constructing the storage area under the bed and in the closets, started one of the couches, finished all of the curtains and are finally getting to do some fun finishing work! For those of you who have been wondering, sadly no, we don't have our AC up and running yet. We literally have everything ready, we just need an HVAC tech to charge the lines. This is where it gets a bit tricky. Since we don't have a electrical plug with enough amperage where the bus is currently parked, we have to get the AC charged at our electricians house (since he has a plug). His HVAC friend said he'd do it but he has been unavailable so far. Fortunately, we're getting things ready to go at our new parking spot and should have electric hookups there shortly. If there's one thing we've learned from this project, it's that things are always more complicated and will take longer than you anticipate. Fortunately, we have an amazing family who have been very supportive throughout the process. 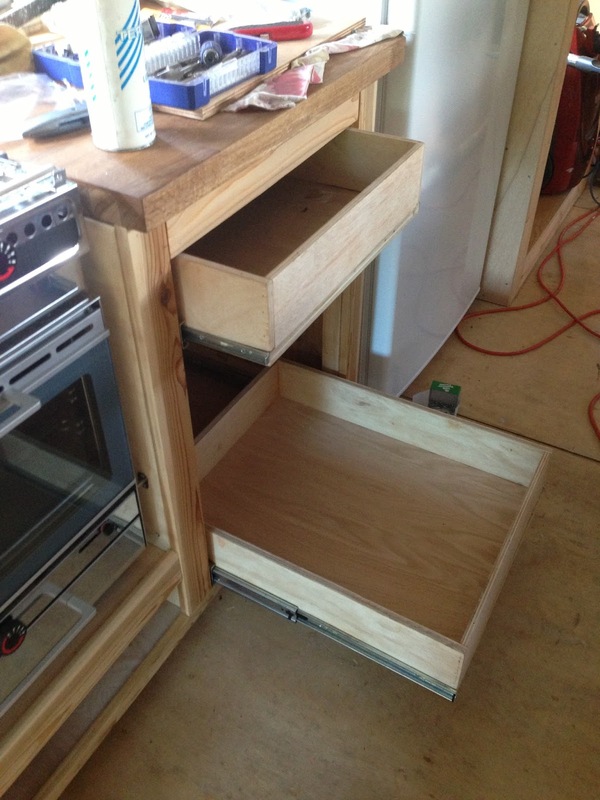 This is the start of the storage area above the stove. We'll keep plates and dishes up there. 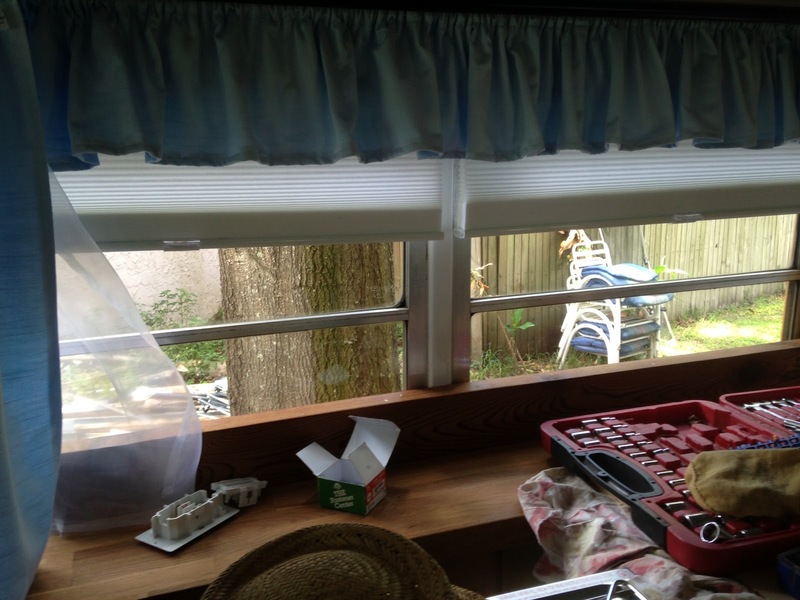 It's also what we mounted the curtain rods to. We were so very fortunate this month to have the help of some really amazing family members. 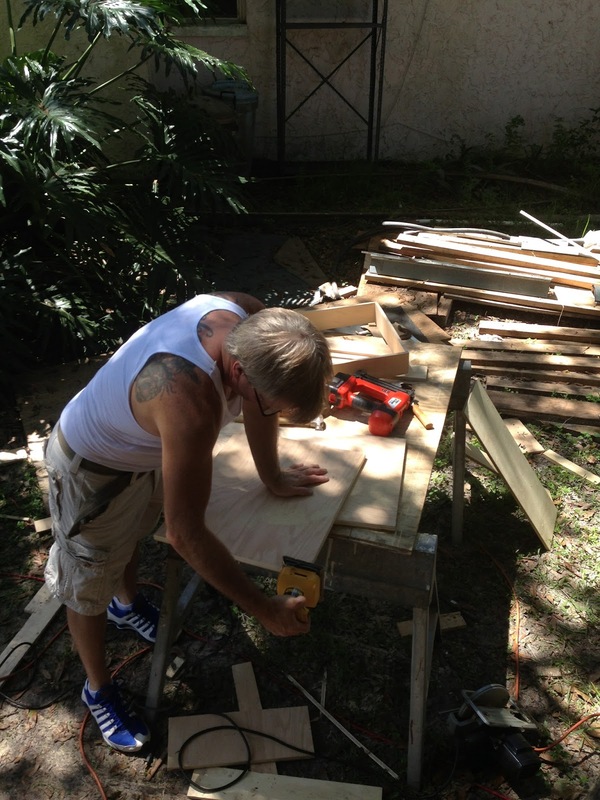 Chris' Uncle Steve came down from New York and used his experience as a cabinet maker to make us some drawers for the kitchen and under the bed. My Cousin Kim also came all the way down from the cold white north to spend a whole week with us. 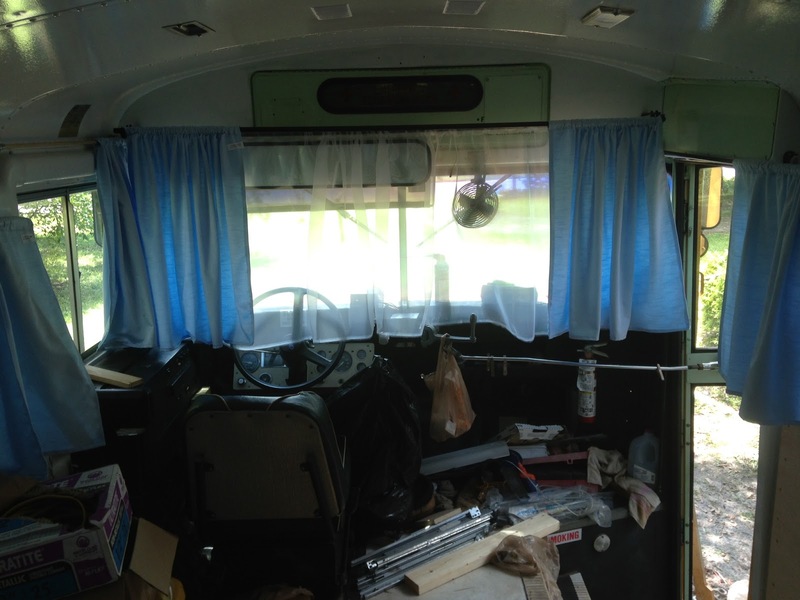 She's an amazing seamstress and sewed over 40 custom curtains for the bus. We bought 26 curtain rods from Ikea to mount the curtains. 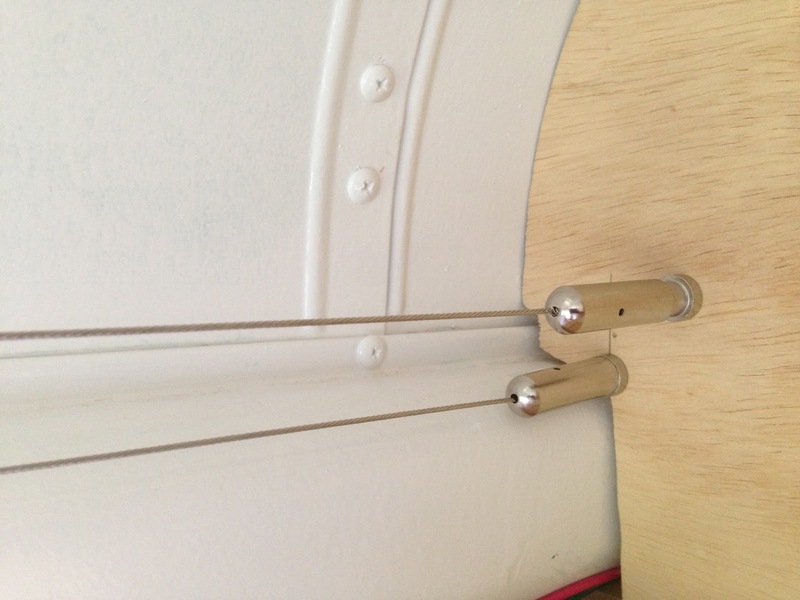 In some areas we used these wire curtain hangers. They're really space efficient, very affordable and super easy to install. 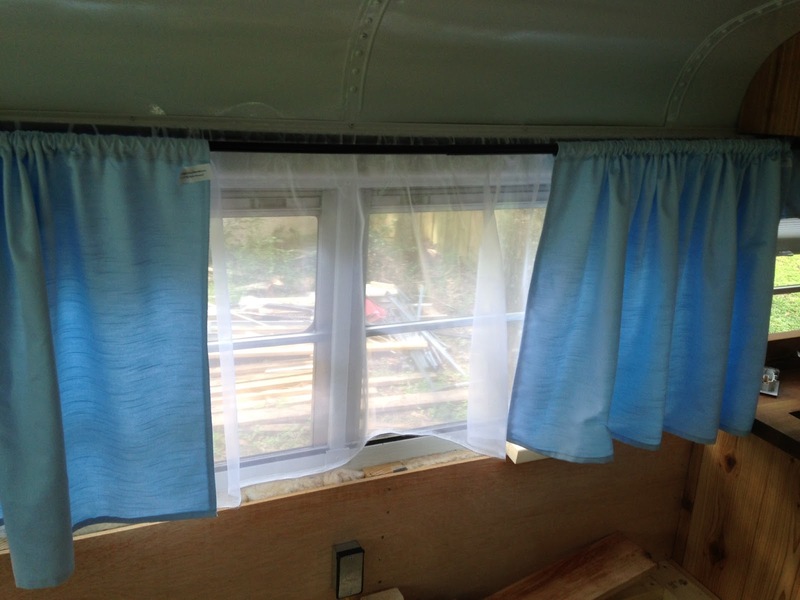 There's a sheer layer of curtain at each window with thicker blue fabric in front. Over the stove we put two mini honeycomb blinds. This was for fire safety reasons, though we're very pleased with the quality and look of the blinds. 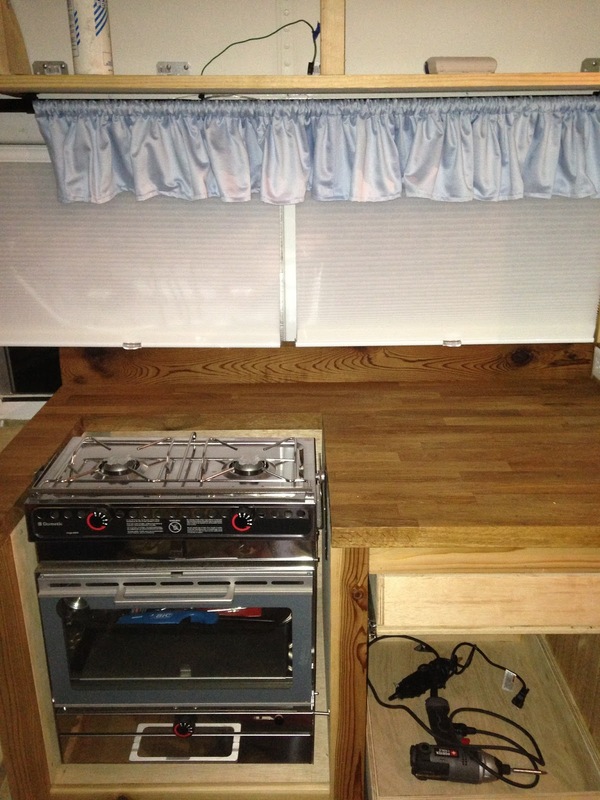 The cute valance Kim added on top really makes the stove area look homey. 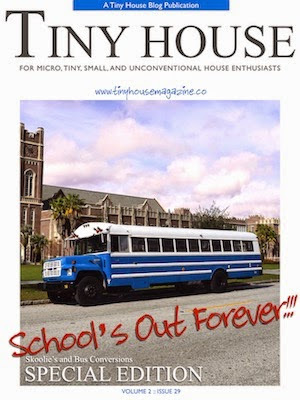 We don't plan on trying to hide the fact that we're living in a school bus. I love how you can see the steering wheel underneath the windshield curtains. 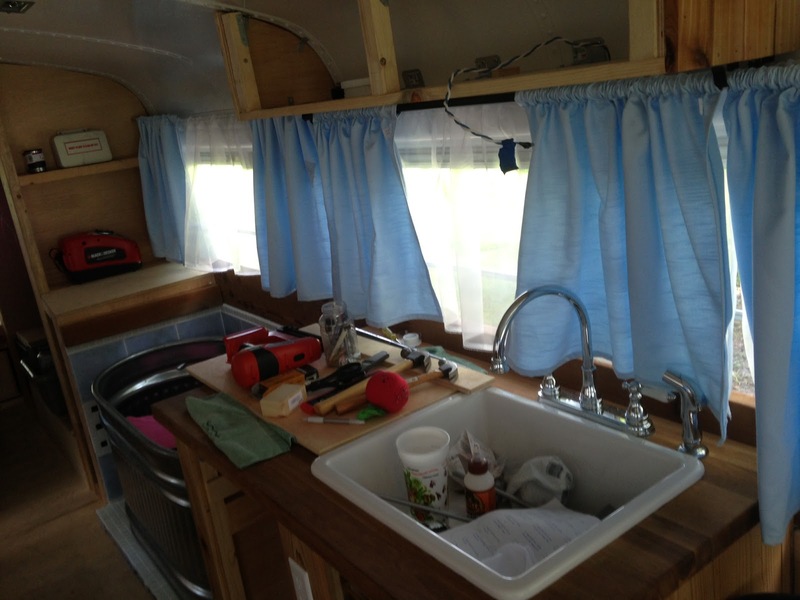 Now that we have overhead storage over the sink, we can install a light underneath. That should brighten up the front area nicely. Unfortunately, my new job requires me to travel a lot and I will be away for weeks at a time until December. Chris has been an amazing trooper and continues to work on the bus. We truly hope to be living in it before September is over!